Located in the popular West Beach neighborhood of Santa Barbara, the Eagle Inn is a comfortable boutique bed and breakfast hotel by the water. The marina and beach are just 3 minutes away, and Stearn’s Wharf/ State Street, Santa Barbara’s main shopping street, are just a 10 minute walk. Intimate and peaceful, this Santa Barbara B&B is an excellent example of Spanish-Colonial architecture, a style characteristic of historic Santa Barbara. Each guest room is unique and spacious with quality furnishings and details. Some rooms feature large whirlpool tubs, fireplaces and balconies ideal for romantic evenings or weekend getaways. The Eagle Inn is known as the most romantic hotel in the area. The bridal suite offers the best Santa Barbara honeymoon retreat location on west beach, complete with a private patio and new fireplace. Several hotel deals are available for honeymoon couples who want to be close to the beach on their special wedding night. The Eagle Inn has clean and spacious Santa Barbara hotel rooms suitable for large families. Each hotel room is equipped with a personal refrigerator, hairdryer, free movie channel TV, coffee maker, direct dial phone, personal room safe and high-speed Internet connection. The Eagle Inn’s proximity to both the harbor and downtown make it one of the best beach side hotels Santa Barbara has to offer. The convenient location is popular with both tourists and business travelers looking for a comfortable downtown Santa Barbara hotel accommodation. The knowledgeable front desk hotel staff can help you plan a variety of fun activities in Santa Barbara, such as fine dining, wine tasting, whale watching, shopping or visiting the local museums. The Eagle Inn is the perfect place to stay when you visit Santa Barbara. Check out available rooms and book a hotel room. Email stay@theeagleinn.com or call (805) 965-3586. 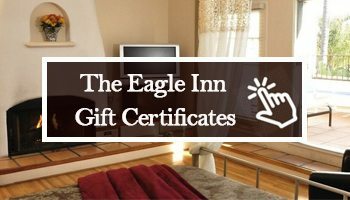 The Eagle Inn offers not only free high-speed Internet in all rooms, but there is also a computer work station for hotel guests to use for sending/receiving e-mail, checking travel arrangements, printing boarding passes, etc. All rooms have their own private bathroom, and some rooms feature a fireplace, an in-room double-size whirlpool tub and a separate, large double-head shower unit. All rooms include free parking. Complimentary hot breakfast every morning.